Today we headed out into Monterey Bay on the R/V Rachel Carson. Our goal was to find the cirrate octopus Opisthoteuthis ‘adorabilis’ for the Tentacles exhibit at the Monterey Bay Aquarium. 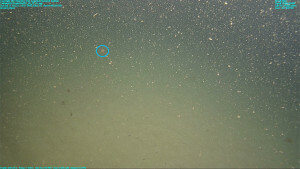 As you can see in the image below, the visibility where these animals are found is limited, so sometimes you need eagle eyes (or a blue circle) to find them. 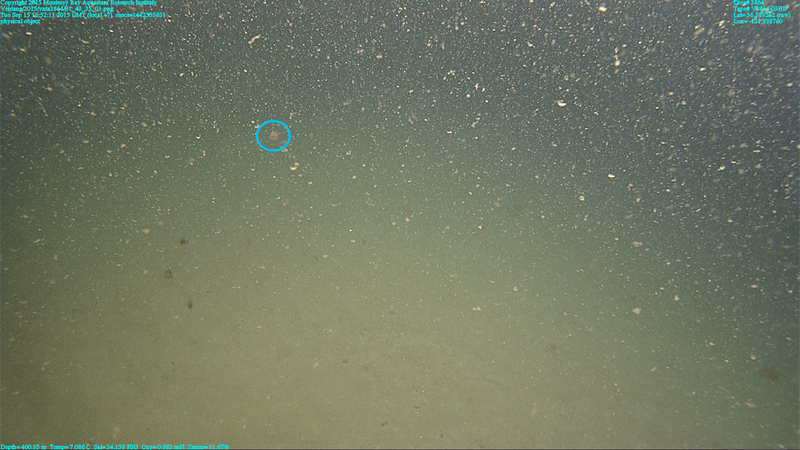 This image is of a very small individual that was drifting by in the water column so quickly that we were unable to collect it. Image captured from a video camera mounted on underwater remotely operated vehicle Ventana on dive number 3864. The second image is of an individual on the bottom, and of a slightly larger size. 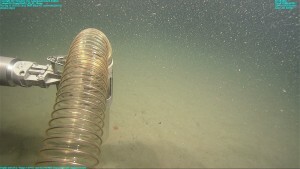 These octopuses are much easier to collect when they are are sitting on the bottom, and we were able to gently collect it with our suction sampler. However, in a highly unusual scenario, the octopus escaped and we came back to shore empty-handed. That’s collecting in the deep sea!